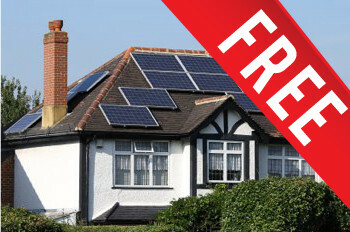 If you don’t want, or are unable, to pay the upfront costs of installing solar panels, many companies are now offering it free as long as they can benefit from your precious Feed in Tariff (FiT). These are often called Rent a Roof or Free Solar schemes and are attractive options to home and business owners who want panels installed and to benefit from cheaper bills, without the burden of the initial outlay cost. Your energy bills will drop significantly, because these solar panel electricity systems will generate free electricity. You might believe that you get nothing for free in this world, so it’s worth taking a closer look at Rent a Roof Schemes. For a full, impartial view, you might want to take a look at what moneysavingexpert.com have to say about them. How do free solar panel installations work? Solar panels benefit from the Feed in Tariff which means any energy they produce is bought by the grid and the profits returned to the owner. For most people looking to install solar panels it is one of the attractive features – earning a steady, often tax free, income and offsetting the initial cost of putting it in. With free installations, this Feed in Tariff benefit goes to the company. Benefit from lower energy bills. You don’t get the Feed in Tariff. You can be tied into a long contract. You have no protection if the company goes out of business. Questions will be asked by mortgage companies should you should want to sell or remortgage your home. Paying up front for your solar panels system is still the most cost effective and better long term investment if you want to make the most of an installation, but, if you want to just reduce your bills and be more carbon friendly, it is a good option if you don’t have the money. One thing to keep in mind is that energy bills are set to soar in the next few years and having a free installation may go some way to negating this. According to a Which? survey a little while ago, the potential profit for a 4 kW system over 25 years, if you have made the initial payment up front, could be as much as £23,000. The possible savings on electricity from the panels would also provide an approximate saving of £5,000. If you had a Rent a Roof contract, you wouldn’t see that £23,000. We all know that contracts need to be read properly, but few of us bother to do it. With something as long term as a free solar contract you need to make the effort. Some contracts have stipulated that home owners need to ask permission if they want to sell their property. If you want to remove the panels for a period of time to do repairs, you might have to compensate the company for loss of income. And, of course, if you want to sell your house you have to find someone who is willing to take on the contract. If you don’t have the money or don’t want to take out a loan, then a free solar offer may be the right choice for you. You must make sure, though, that you both take legal advice and explore fully the type of contract you are getting into. Just because free solar panels are available doesn’t mean that you’ll get them. Most installers who offer the scheme will need to check your property. If the roof size is too small, or they don’t think they will get a sufficient return on their investment, then they may well turn your property down. Check with your mortgage provider first – they may not agree to the installation and might have concerns about the nature of the contract. Ask the right questions from the installer/company – in other words, do all your research and make sure you know what you are talking about. Check your contract carefully and get the right legal advice. You are signing a 20-25 year contract so be aware of what you are getting into. What if the free solar company goes bust? Check who is responsible for repairs to the roof and/or solar equipment. If you can manage it, find the resources to pay up front for your installation. It gives you a better long term investment and more control over the future of your solar panels. Find out more about eco finance for your solar panels. If you think that you won’t be able to get finance to cover your solar panels project, then you might like to consider the government’s Green Deal loan scheme that can help fund renewable energy projects. Discover what the Green Deal means for you.